Distressed home sales still represent a thriving segment of the Tallahassee real estate market, but there is a positive trend among troubled home sellers that is worth mentioning. While 28% of the closed home sales in Tallahassee thus far in 2015 have been short sales, foreclosures, pre-foreclosures, and bank owned properties, only a small percentage of those were short sales. Part of the reason that we are seeing a decline in short sales is due to the termination of the Mortgage Debt Forgiveness Act, under which any debt forgiven in a short sale is not counted as income for homeowners whom banks allowed to sell their homes for less than the amount of their mortgage. This has not been extended for short sales conducted in 2015, thus the motivation for upside-down homeowners to conduct a short sale (versus allowing a foreclosure by the lender) is greatly reduced. The primary reason for the reduction in short sales (I believe) is that the majority of non-performing loans in Tallahassee are old and established, and thus they are problems now being handled by lenders. These are sellers who either tried and failed to do a short sale or declined to do one altogether. In the graph above, all closed distressed home sales through April 25, 2015 are divided into two separate groups. The blue columns measure the number of short sales through April each year, while the red columns measure the number of non-short sale distressed home sales, and both are recorded on the left vertical axis. (Note: All data is year to date through April for 2010-2014, but 2015 is only through April 25). The ratio of short sales to all distressed sales is shown as a blue line and measured on the right vertical axis. I think we can conclude from this graph that the perceived value by homeowners in doing a short sale is nearly gone. The following listings are the distressed homes for sale in Tallahassee; the complete list can be seen by clicking through to the property search tool. 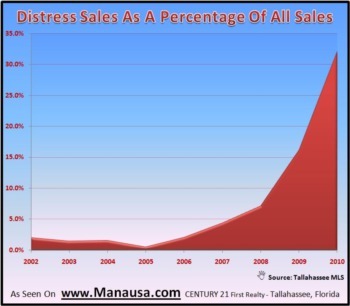 I hope you have gained insight into the ever-changing distressed home sales market in Tallahassee. If you questions or further insights that you would like to share, simply drop me a note and we will be in touch with you promptly.